As hated as he has been, Ben Affleck was a great choice. He’s always been great at not putting any layered meaning into his lines or making facial expressions or showing emotion of any kind. Photos courtesy Warner Bros. Pictures. We’ve already had one movie this year where Ben Affleck throws an autistic tantrum, and it was one too many. Now it’s two too many. The Accountant tells the story of the title character (Ben Affleck) and how awesome and amazing and cool he is even though he has autism. The accountant is a contractor who uses his wicked autistic math skills to perform internal audits for international criminals — and a ninja, who can kill anyone who comes after him! In the movie, he’s auditing a boring, not criminal Chicago-based tech company after a saucy young accountant of their own, Dana Cummings (Anna Kendrick), discovers some inconsistencies. But we know he does audits for criminals, too, because treasury agent Raymond King (J.K. Simmons) tells us so. He’s looking for the accountant, but can’t find him because, despite his autism, the accountant is a super-badass who uses all sorts of fake names based on famous mathematicians! Hey, did you know Lewis Carroll may have had autism? Autism! The problem with The Accountant is it goes for a big reveal, but that reveal is the central nexus of the movie’s plot. There’s three or four different story threads intersecting here, but viewers have no idea how they intersect or even that they intersect until the reveal, so the majority of the movie doesn’t appear to have any story at all. Seemingly disparate things happen, and the reveal is that they actually had causal relationships all along. The difficulty with this structure is you’re asking viewers to care about characters and not telling them why they should until the end of the movie. That’s a very doable, but it takes focused, intelligent character development for several characters who are introduced completely separately from each other paced in such a way that it doesn’t get boring. 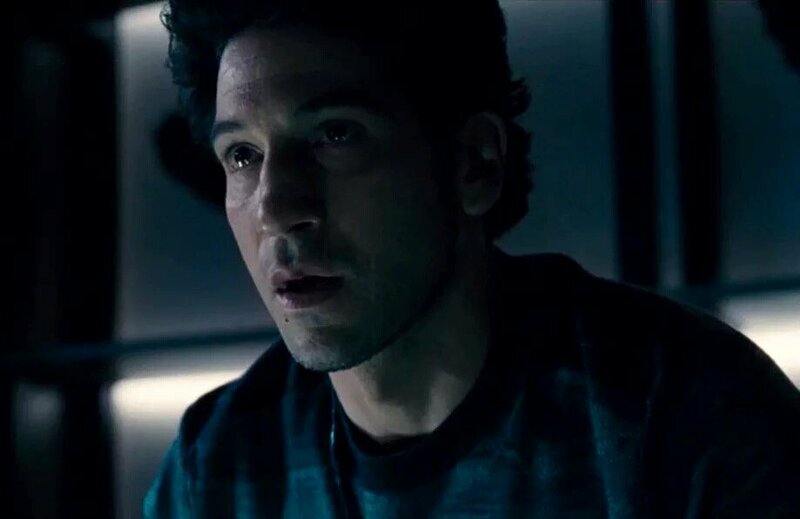 Jon Bernthal steals the show as a talkative, charismatic head of a private security team who serves as a foil for the lead. Basically, you can do it if you’re really, really good at making movies, but otherwise it’s not going to work at all, and it doesn’t work at all here. “Show don’t tell” is one of the central tenants of character development — and filmmaking in general — and while The Accountant does show, it shows very tellishly. The first 20-30 minutes of the movie are scenes set up entirely to establish character traits in the most heavy-handed way possible, and while they’re connected later, it isn’t clear why we’re shown these things and feels like the story doesn’t start until we’re through it. The movie is clearly aimed at people with a lower IQ score, over-explaining its every aspect and not trusting viewers to figure anything out. Of particular distress is King’s abuse of treasury worker Marybeth Medina (Cynthia Addai-Robinson), whom he threatens and then demands that she do the job she’s already being paid to do. The Accountant is not without merit. It’s packed to the gills with some great shootouts and fight scenes, and the composition clearly had some attention put into it. Whenever we enter the accountant’s tightly structured space, the film takes a very organized, square style with a lot of regular polygons and organization. This movie is grotesquely offensive, offering up reductive, incredibly severe autistic tantrums while also portraying Asperger’s syndrome as some kind of superpower. This part also seems to be aimed at dumber viewers who have never heard of the relatively common disorder and could be duped into thinking of it as an X-Men type mutation that makes people beautiful and unique and even moreso because society fears and misunderstands them, instead of a potentially crippling social disability that causes people to suffer their entire lives. Leopold Knopp is a formerly professional film critic, licensed massage therapist, intern at the Lewisville Texan Journal and journalism student at the University of North Texas. Like Reel Entropy on Facebook, follow it on Twitter @reelentropy, and shoot questions to reelentropy@gmail.com. This entry was posted in Entropy and tagged #anna kendrick, #Batfleck, #batman v superman, #Ben Affleck, #illuminati confirmed, #sad batman, #X-Men, Aspergers syndrom, Aspergers syndrome is not a superpower, Autism, Carrollton, JK Simmons, jon bernthal, Lewis Carroll, Lewisville, The Accountant. Bookmark the permalink.